WFP Executive Director Ertharin Cousin with a Syrian refugee child. The head of United Nations World Food Programme (WFP) called today on the international community to continue supporting Syrian refugees displaced in neighboring countries, appealing to the world “not to forget” the crisis and to provide the agency the means to meet their needs. Major funding shortfalls forced the agency to cut food assistance by up to 50 per cent. During her four-day visit to Jordan and Lebanon, which she concluded today, Ms. Cousin met with Syrian refugees and government officials, bringing attention to the plight of millions facing extreme hardship as a result of these cuts. Since the beginning of the year, explained a press release from Beirut, WFP has faced critical funding shortages that forced it to reduce the level of the assistance it provides to some 1.5 million Syrian refugees in Jordan and Lebanon, but also in Turkey, Iraq and Egypt. Families are taking extreme measures to cope with their difficult circumstances, including removing their children from school so that they can work; incurring large debts and cutting back on the nutritional value and quantity of the food they eat. Ms. Cousin visited Syrian refugees living in makeshift shelters in Lebanon’s Bekaa Valley and a family living in an overcrowded apartment in Amman, Jordan. Each of those interviewed told heart-wrenching stories about the increasing difficulties experienced in their everyday attempts to manage with ever shrinking resources, asking Cousin to remind the world about their suffering. Acknowledging the heavy burden host countries carry, she visited shops where half a million Syrian refugees in Jordan and 770,000 in Lebanon benefit from WFP’s electronic voucher programme (e-cards). While generating income for host communities by injecting more than $1.1 billion into the local economies of the five neighboring countries, the programme has also created thousands of local jobs in the food retail sector. WFP’s regional refugee operation immediately needs $163 million to continue to support desperate people through October. In 2014, WFP globally received $5.38 billion in contributions – 27 per cent higher than in 2013. This was in response to an unprecedented number of emergencies in places such as Syria, Iraq, South Sudan, and the West African countries affected by Ebola. However needs are still rising worldwide, outpacing the available funding. 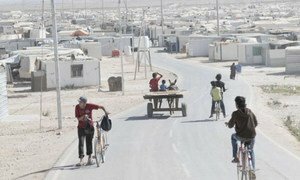 The United Nations World Food Programme (WFP) has voiced concern over the deteriorating conditions of Syrian refugees now residing in Jordan amid funding shortfalls and urged the international donor community to ramp up financing for ongoing humanitarian efforts in the Middle Eastern country.